As part of our celebration of National Poetry Month, we're featuring the work of a wide variety of poets, such as Pablo Neruda! Born Ricardo Eliezer Neftali Reyes y Basoalto, Neruda hailed from the countryside near Temuco, a city in southern Chile. He was a prolific writer even at a young age. By the time he graduated from high school, he had already adopted the pseudonym that would later become his legal name, and was publishing poetry in local newspapers and winning writing contests as Pablo Neruda. He was lucky enough to meet future Nobel Laureate Gabriel Mistral during his youth, and Mistral, recognizing a fellow poet in young Neruda, provided the support and guidance that helped shape Neruda's early writing. While in the Chilean capital of Santiago, attending university, Neruda published his first book of poetry, Crepusculario, or Twilight, which gained little attention but did provide him the foothold he needed to find a publishers for his second book, Veinte poemas de amor y una canción desesperada, translated as Twenty Love Poems and a Song of Despair. This earned Neruda almost immediate acclaim as a rising star of Spanish poetry, and, subsequently, a position as an honorary consul to Burma. Poets in Latin America were frequently considered for such positions, and the more prominent the poet, the more prominent the consul position. During his early travels as a diplomat, Neruda was surprised and horrified by the squalor, pain, and senseless misery he found in much of the world. He channeled these feelings into the first two volumes of Residencia en la tierra, or Residence on Earth, exploring the despair and seemingly unanswerable questions of mankind's existence. He softened this position somewhat in the third volume of Residencia en la tierra, Tercera residencia, which was written after he discovered the ideals of Communism and, in them, some of the answers he was seeking. Neruda's increasingly political works began to cause concern regarding his position as a Chilean diplomat. He was recalled from Spain during the Spanish Civil War after his politics were deemed potentially dangerous, but back in Chile, his works and their Communist underpinnings were increasingly popular. He was elected to the Senate, but was expelled and nearly arrested when Communism was declared illegal in Chile. Neruda contined to write prolifically while in exile, returning to Chile in 1952. Though known as "the people's poet" in Chile, his works are notoriously difficult to translate adequately into English, and only a fraction of his work is well known outside the Spanish-speaking world. He received the International Peace Prize in 1950, and, in 1971, the Nobel Prize for Literature. 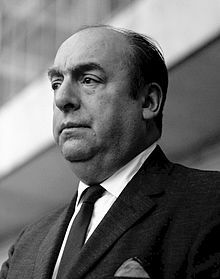 Neruda died of cancer in 1973. He was 69.